Harringtons Complete Dry Food for Puppies is a premium quality food that provides essential nutrition for puppies from 3 weeks onwards. 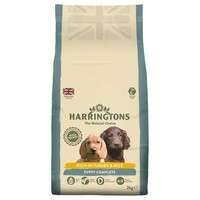 Containing Turkey as an excellent source of protein to promote healthy growth, Harringtons Complete has been made with completely natural ingredients and contains all of the essential vitamins, minerals and nutrients your puppy requires for the best start in life. I fed my puppy on this for a little while, but I did find the feeding amounts quite high, and he did have slightly soft poos. Not for my boy, but definitely worth a go for anyone looking in this price bracket. Absolutely fantastic food! Puppy loves it the only thing I would have wished for is that it be a 15kg bag. This is because puppies grow so fast and eat alot so they could have done with doing the 15kg size just like the adult bags! I dont understand why its just 10kg. But anyway its lovely food 10 out of 10! : )) Firm stools no running ones, and licks bowl clean and empty.